An ambitious eco-tourism initiative aiming to get the population of Nairn out into the brisk fresh air is set to be rolled out across the town following a £7,000 Lottery cash injection. 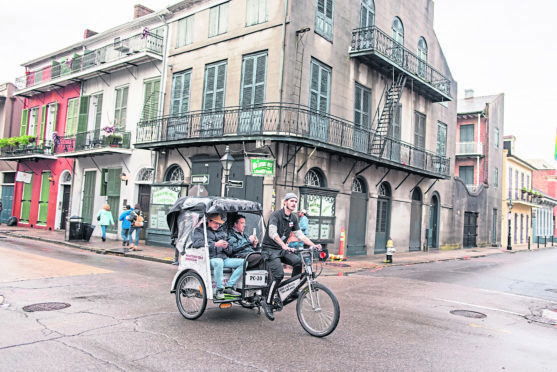 Riviera Rickshaw Rides will give tourists and local residents the opportunity to embrace the great outdoors by offering rides in the vibrant modes of transport along the riverbank and connect users with the community’s top attractions. The quirky and eco-friendly form of transport was commonly adopted by Asian countries during the 19th century. The initiative has been brought forward by charity Riviera Community Enterprises, which hopes to have a total of three Rickshaws in operation, costing in the region of £10,000 each. Two rickshaws will be primarily focused towards the tourist market, with the third being used to encourage the elderly population of Nairn – who are living in a care home, living in their own homes or are housebound – out into the fresh air. The project is one of six recipients in the Highlands to be awarded a share of £794,384 by the National Lottery Fund, receiving £7,000 to aid towards the financial costs of the project. The highest award in the Highlands was given to the group ASAS to build a ramp and decking, providing access to their holiday caravan for people with learning difficulties. Other organisation who have received funding include No Limits Caithness who received £7,334 to run a life skills project for children with additional needs. Health and Happiness in the Highlands also received a grant of £7,000 to finance two members of staff to continue their activities for individuals with learning difficulties and mental health issues. And Kyle of Tongue Community Fun Weekend will now be able to run their fun event for a sixth year following a £3,900 award. Dunvegan and District Senior Citizens Club also received a £3,500 award to provide opportunities for people over 60 to come together one a fortnight to socialise.